The Leatherman MUT is a great field companion for AR-15 maintenance. The Leatherman® MUT® (Military Utility Tool) is another outstanding addition to an already extremely impressive line of purpose-built utility tools. Designed specifically for field use by members of the military, the 16-tools included in the MUT easily transfer to use by the street patrol officer or armorer. The MUT tools include standard pliers, knife, a bronze carbon scraper, disassembly punch, and bolt override tool particularly designed for field maintenance of firearms. Like almost all Leatherman tools, the MUT folds up into an easily carried compact package with an included carry pouch. The pouch can be worn on a belt or with Molle. Leatherman has one of the finest reputations in the utility tool market, and many would say they are the stand-out best. 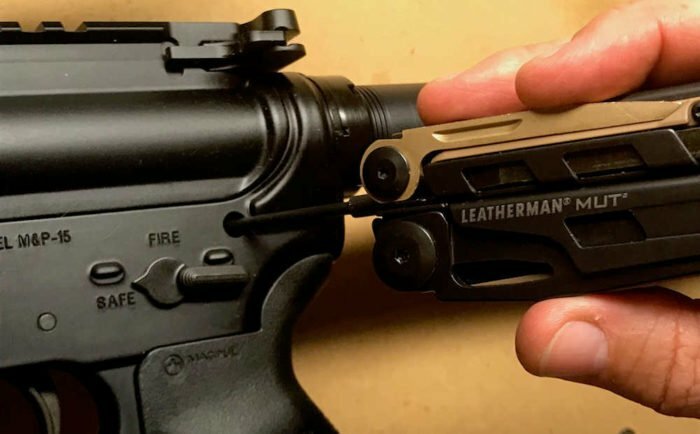 The Leatherman MUT is an excellent AR-15 multi-tool, but offers much more as well. The Leatherman MUT (Military Utility Tool) is designed with field maintenance of critical arms and accessories in mind. Centered around a fairly common Leatherman utility tool chassis, the MUT shines in its intended purpose with easily accessible tools made from the highest quality materials. The same attention to detail and highest quality craftsmanship, is sure to make the MUT a go-to item for military, law enforcement, competition shooters, and outdoor enthusiasts alike. What I really like is the dual-purpose of several tools, granting the highest level of function while keeping the overall size and weight down. The Super Tool® 300 EOD – An EOD and Firearms multi-tool with (20) tools. 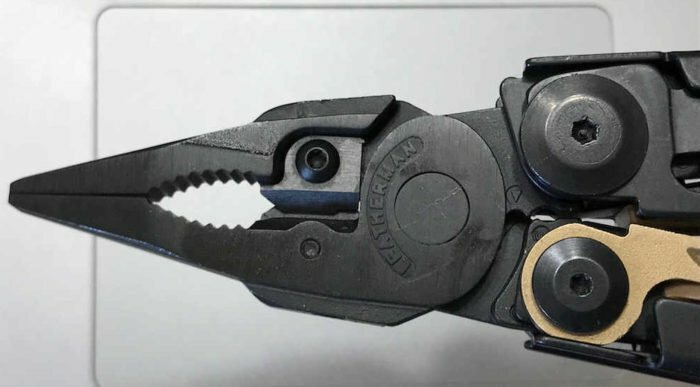 *EDITOR’S NOTE: The Leatherman website shows the MUT with (15) tools, the MUT EOD with (16) tools, and the Super Tool 300 EOD with (19) tools. However, the Leatherman MUT instructions packet included with my MUT clearly shows the tools listed above. Most of the Leatherman advertising photographs depict the AR-15 (or M16/M4 for military users), and truly the MUT is a great tool to keep your favorite “black rifle” running. 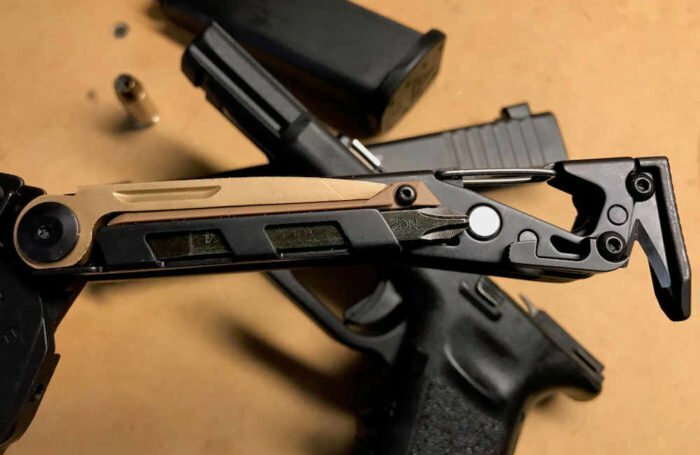 However, it really doesn’t take too much closer inspection to realize the MUT can be a go-to tool for many of your favorite firearms, whether a rifle or a pistol. To start off with, the MUT comes with the almost standard needle-nose pliers that are perfect for gaining tension and traction on hard items in tight places. These pliers appear to be made from stainless steel to provide longevity and corrosion resistance (though not mentioned on the Leatherman site). The interior of the pliers forms the standard curves and grooved surface of standard pliers. At the bottom of the pliers openings are two sharp edges on opposing jaws designed for wire cutting or similar jobs. Finally, inside the pliers joint is the near ball-bearing smooth action Leatherman users have come to expect. The Leatherman MUT comes with needle nose and standard pliers. Soft and hard wire cutters, along with a wire crimper, are located above and below the pliers pivot point. At the interior base of the pliers head, the MUT offers a replaceable wire-cutter. Each wire-cutter blade is built into the frame of the pliers, but tucks in neatly to avoid interference with the use of the pliers. These blades are perfect for cutting or trimming electrical or softer wires. To sharpen, replace, or clean the wire-cutters the user simply needs a 2mm hex driver to remove and then re-secure the blades. In addition, the wire-cutter blades offer a hard wire-cutter notch at the bottom of the standard wire-cutter blades to cut through tougher wires, like barbed wire, or metal retention wires. Below the base of the pliers frame, where the two pliers arms swivel together or outward, there is a convenient out-of-the-way standard wire cutter, and a wire crimper completing the (6) tools just in the head of the MUT. The 420 HC combination razor/serrated knife is always helpful, even for little jobs. 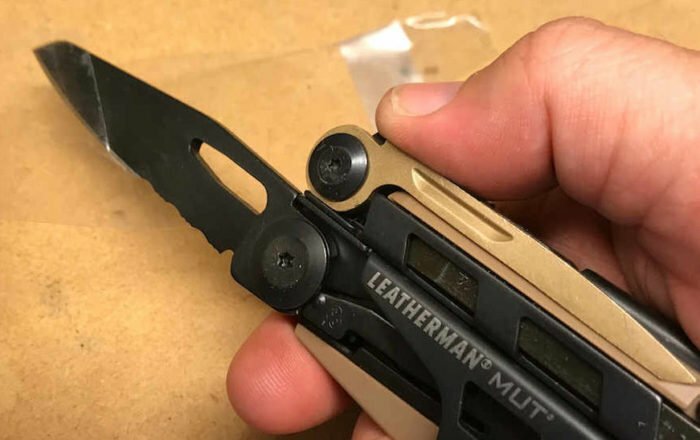 Moving down the MUT onto the right handle (with the “Leatherman MUT” emblazoned on its outer edge) the user finds a nice 420HC combination knife. The knife offers a razor edge at the tip and triple serrations on the rear of the blade. The blade is attached to the MUT handle with a hex-bolt joint providing solid control with an easy opening. The opening is assisted with a machined out area in the spine, making thumb-activated opening easy and natural. The blade uses a simple slide lock bar to give the user confident use without fear of the blade folding back onto the user’s fingers. When finished, the knife folds into the handle protecting the user’s hand and the blade. Behind the knife, on the other side of the dual slide lock mechanism, is a very sharp triple serrated saw blade. The saw blade also offers a machined out area on the spine for easy manual opening, and is secured by a slide lock bar. This is actually an ideal tool for more than just cutting small branches. The sharp crisscrossed teeth will shred a box or packaging in an emergency allowing the contents to be quickly realized and used. As a police sniper I appreciate adding a quality saw blade to create natural camouflage or cut away foliage for a perfect final firing position (FFP). The saw blade is a great addition for military and LEO needs, but also handles every-day jobs. At the end of the top handle the MUT offers an integrated and interchangeable Phillips-head and standard screwdriver bit. When first checking out the MUT you’ll find the shorter screw bits installed. However, looking inside the compartments on the outer edges of the other handle will reveal the longer 2″ bits as well. These are secured in the grip by an ingenious push-button slide lock. Once the button is pushed inward (extending further out on the other side of the handle) the longer bit is able to slide out. Push the button into the middle and both bits are securely stored inside the handle compartments. Included are a #1-2 and 3/16″ bit, and a #2 and 1/4″ bit. On the torque side there are included #15 and 7/16″ bits. The bit is secured in the MUT handle by a simple spring lock mechanism, that presses a notch in the bit into a curved lip at the base of the handle. 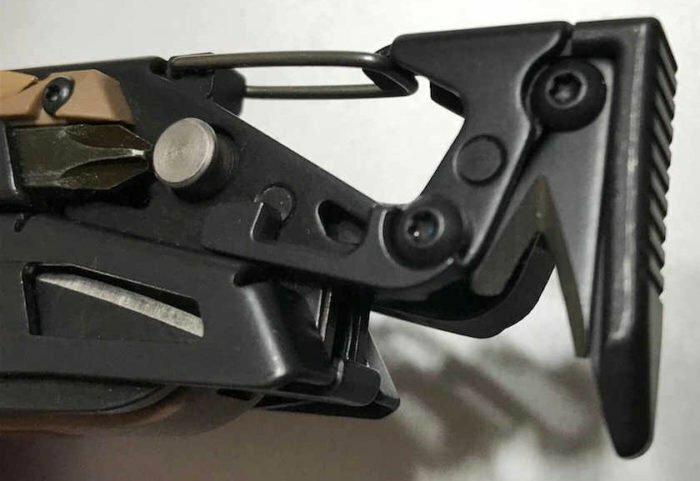 Simply pressing inward on the spring mechanism (from the inside of the handle) releases the bit to allow switching from Phillips head to Standards head. Having a screwdriver is almost a must-have for utility tools, and this one is solid for assured driving. 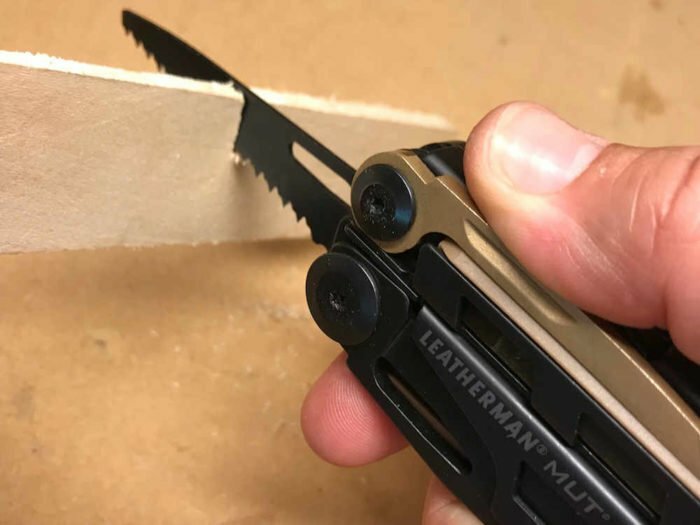 Though interchangeable bits can sometimes loosen and be hard to keep in place (storage and use), the Leatherman MUT uses a somewhat elongated bit with squared backing for a tight fit that still allows relatively easy change-out. Pressing the spring-activated lock releases the driver bit to change from Phillips to Standard. The longer screw bit in its compartment under the copper scraper. Note the silver push-button lock. Though interchangeable bits can sometimes loosen and be hard to keep in place (storage and use), the Leatherman MUT uses a somewhat elongated bit with squared backing for a tight fit that still allows relatively easy change-out. As shown above, the long bits have storage compartments on the left handle. The smaller bit has a storage compartment in the brown plastic piece in the middle of the right handle, allowing the user to avoid damaging the bits when not in use. The MUT copper scraper can get into the tight spaces of the AR-15 chamber. Moving to the left handle (when looking at the emblazoned “Leatherman MUT“) the MUT enters its weapons-maintenance role. The first tool is the replaceable copper carbon scraper designed with a fine point and a near Tanto-cut belly. This design allows the user to get into the tightest spaces, while also providing enough scraping edge to be useful. The long and skinny copper scraper offers a sharp knife-like edge for bigger and more open jobs, and is easily extracted by a beveled finger/nail groove on the spine. A machined groove provides ample grip to easily extract the scraper. 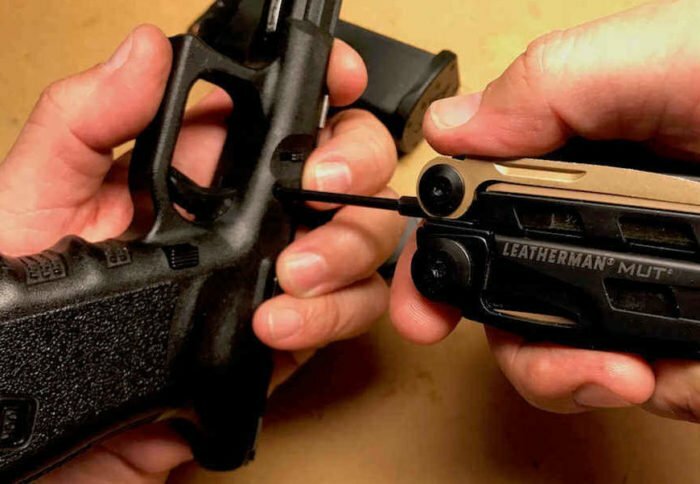 Behind the carbon scraper Leatherman adds a replaceable firearm disassembly punch. This punch is perfectly designed to fit many common rifles and pistols. 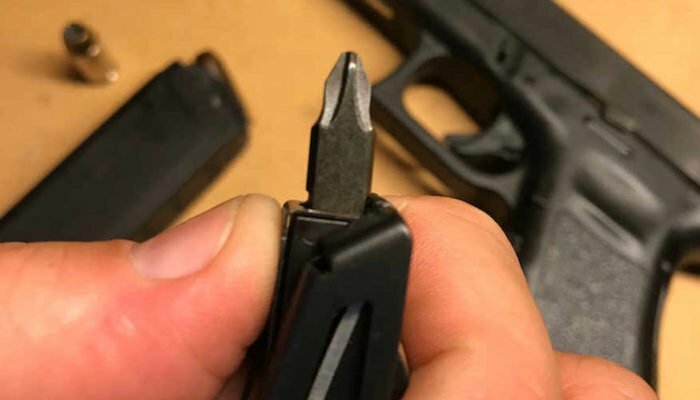 The punch is narrow to accommodate pistol pins, but should not cause too much effort for larger rifle pins like on the AR-15 (M4 for military users). Once removed the receiver for the punch can accept many common cleaning brushes and jigs adding more versatility. In addition, there is a screw hole about 1/3 down from top of the left handle, allowing cleaning attachments to be connected while providing a T-handle grip for more traction during cleaning spins. The Disassembly Punch is a great addition for any firearms maintenance tool. The MUT Punch can be used on many pistol pins, just like the rifle pins. Sliding down the bottom handle we find a dual-purpose Carabiner holder. This is perfect for jobs on the go, or under stealth conditions, when fumbling with the included pouch may not play out well or be wise. The retractable Carabiner arm is solid and leaves no doubt the tool is secure when attached. Attaching the MUT to a ring, belt loop, or Molle strap is accomplished very quickly. However, the tool doesn’t stop there. The shape of the carabiner opening is designed to be a bottle opener and possibly even a can opener. This is the versatility Leatherman is famous for, and this addition is perfect for intended users. At the end of the bottom handle is a small hammer and replaceable cutting hook. The hammer won’t beat ole John Henry laying rail on the trans-continental railroad, but it will be just fine for smaller jobs in a crunch. The cutting hook is multi-purpose as well. The edge and opening will have no problem cutting through seat belts for emergency extractions, but will also handle much smaller jobs like cutting Paracord or small rope to hide building, pack management, and other tasks common in the field. The MUT offers a Carabiner carrying option, small hammer, and cutting hook. Finally, the tip of the MUT’s hammer is a beveled edge designed to be a bolt override tool. This perfect addition and multi-purposing of another tool adds to the overall potential of the MUT in field service. 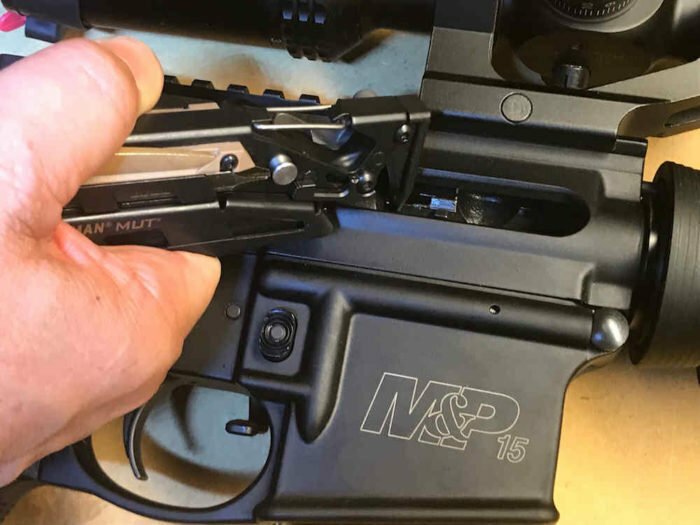 The bolt override tool is an important tool to have for one of the most difficult AR-15 malfunctions. A bolt override occurs when brass or a live round gets wedged between the bolt carrier, chamber and the charging handle. 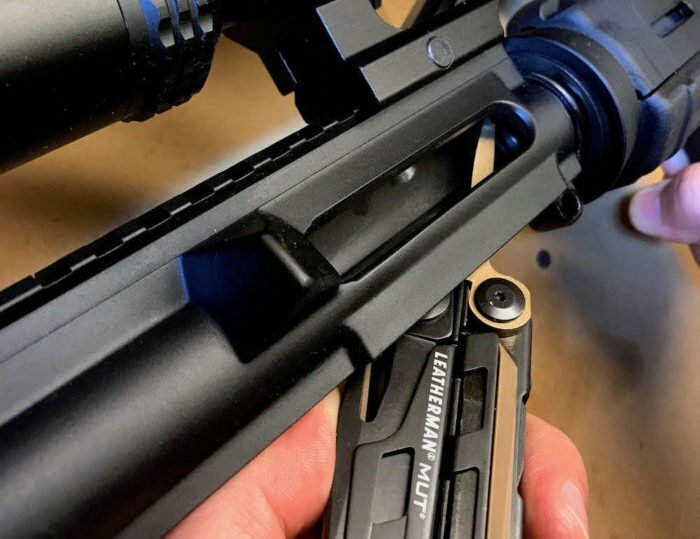 By inserting the bolt override tool into the chamber, the shooter can attach to the bolt or bolt carrier and forcibly move the bolt rearward to clear the jam. Finally, the Leatherman MUT comes in a nice tan or black canvas pouch with a snap belt-loop or Molle attachment slots on the back side. There is a cover attached by Velcro, but unlike many cheaper products the last inch of the cover’s edge does not have Velcro allowing easy gripping and accessing. The snap belt-loop has a pocket on the backside where the final tool, a combination 1/2″ and 3/8″ wrench, is easily stored and protected. The wrench is perfect for many common scope rings or mounts, adding just one more outstanding feature. The Leatherman MUT bolt override tool is perfect for clearing tough malfunctions. A well-made canvas carrying case gives the MUT mounting options and a dual wrench. I have used many Leatherman tools, but am somewhat embarrassed to admit I have only owned (2), my new MUT being one of them. 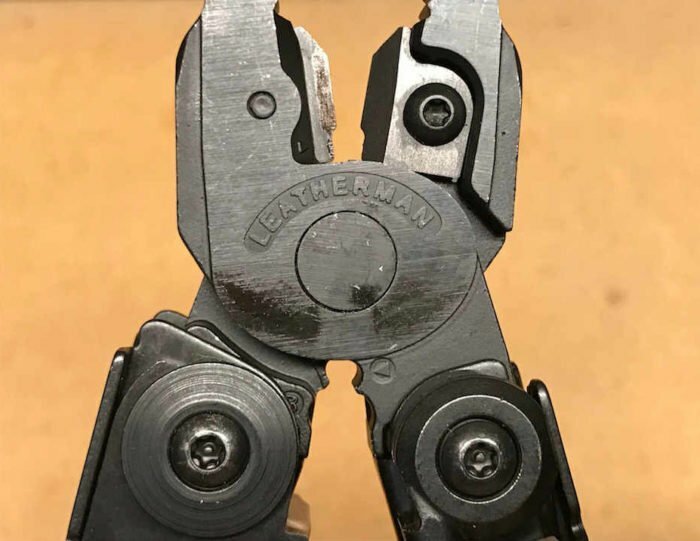 The high quality of Leatherman tools often comes with an expensive price as well, causing me to often opt for a cheaper copy for menial tasks. However, the MUT is just so loaded with critical tools for the job I could not resist a purchase. Of course, the outrageous sale price (less than $60.00) was an easy decision-maker as well. The Leatherman MUT has been a great multi-tool addition. At first glance, the MUT looks to be a fairly ordinary (if not simple) multi-tool. 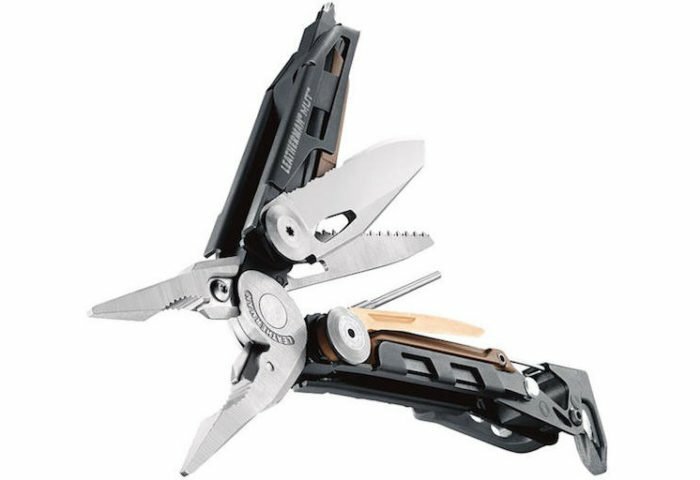 However, Leatherman has masterfully engineered the MUT to be a powerhouse multi-tool with most of the tools having more than one purpose. 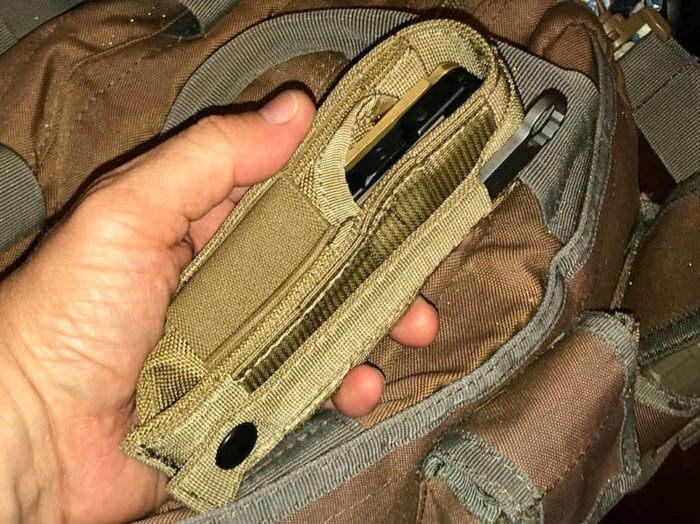 The compact design is perfect for on-the-go carry, while providing enormous work potential on critical tasks for firearm maintenance and common jobs. Without question I would recommend readers purchase and carry the Leatherman MUT.